The US Open Cup is one of the longest running professional sports competitions in North America. This years installment is the 100th edition and with it comes live streaming. Free live streams of all of the games in the 4th round of the tournament. Most overlook the US Open Cup with such a busy sports time in North America it’s easy to do. With the Stanley Cup Finals, NBA Finals, US Open, World Cup Qualifiers, Major League Baseball and the College World Series. TV networks have plenty to choose from and the US Open Cup isn’t going to pull the same numbers the Stanley Cup Finals or NBA Finals are. However there is a market for the US Open Cup and a low cost solution is available to let fans around the country watch the matches. This is really a perfect storm of opportunity. No TV deal, low production costs, existing bandwidth and an unserved viewer. The one caveat is the bandwidth. If dedicated, high-speed bandwidth isn’t available then the viewer may just turn away. There is no TV deal for these matches which means that the clubs and US Soccer can try all kinds of new things to let viewers watch the matches. Several platforms are available but most clubs opted for either YouTube or Ustream. YouTube allows channels with 1,000 subscribers to stream video which lowered the barrier of entry even more for content creators. You continue to hear noise from media companies about TV Everywhere and second screen experience. 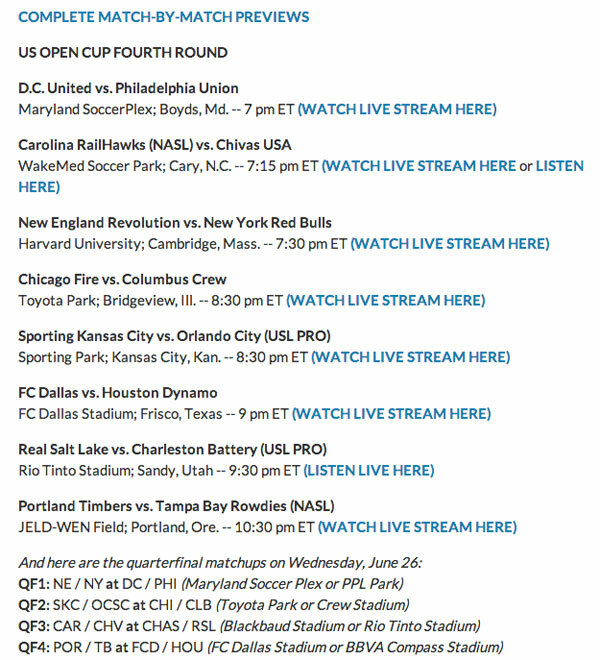 The clubs in the US Open Cup, whether the New England Revolution or the Carolina RailHawks, took an obvious leap with free live streaming of the Cup matches. That leap, giving the fans what they want. No log ins, no sign ups, and no restrictions.